South Jersey Eye Associates carries a huge selection of contact lens approved by the FDA, from disposable to tinted to lenses customized for special vision needs. Are contact lenses right for you? 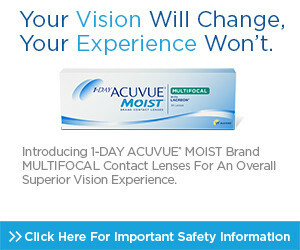 Advances in lens technology have made them more comfortable and convenient than ever before. In addition, there are now lens for a much broader range more vision disorders—including farsightedness, nearsightedness, astigmatism, even bifocal needs. Let our eyecare professionals help you decide whether contacts might be right for you. Now you can order your replacement contact lenses online through our website 24 hours a day, seven days a week! At SJEA, we’re dedicated to taking the time and care to fit you for contact lenses properly and with the least amount of stress possible. We make sure that you leave our offices with all the information and training you need to live comfortably and confidently with your new lenses. Our patients can CLICK HERE and a new window will open, which they can use at their convenience to order their replacement contact lenses 24 hours a day, seven days a week. If you have not previously registered to order replacement lenses through our website, please click the “New Patient Signup” link. If you have previously registered to order your replacement contact lenses through our website, please log in using your username and password. If you have lost or forgotten your password, please click the “Forgot Password?” link . If you have any inquiries please contact us at 856-455-5500 or Email Us.